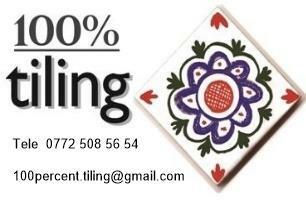 100% Tiling - Tiler - Tiling based in Leeds, West Yorkshire. Welcome to 100% Tiling where all aspects of Tiling work are covered. With over 27 years of qualified tiler experience, trained at The Leeds College of Building and with hundreds of happy customers we pride ourselves in offering prompt, efficient high quality workmanship and excellent customer service. With so many different and creative tiles and designs available we can work with you to help create your idea and vision. With a friendly, reliable service we are certain that you will be happy you chose 100% Tiling for your tiling needs and we look forward to your call.